I am not sure that the village of Foulden had ever registered on my mental radar before, and I was surprised to discover that it is quite large. My lack of familiarity is partly due to it being one of those seemingly remote places in the area between Swaffham and Downham Market, where the lanes wander and meander, never seeming to go anywhere in particular. These are working villages, too far from anywhere of any size to attract commuters, and there are few holiday homes - this is not a pretty part of Norfolk. All Saints is a rough and ready church, set in the main street with bungalows and a garage for company. I liked it a lot for this. It made it seem real, and more vital. It reminded me of villages in western France. It must have been a big church once, but the tower collapsed in the 18th Century. Enough survived for Ladbroke to draw in the 1820s, and in 1855 White's Directory could report that the tower is an ivy-mantled ruin, but the rest of the fabric, after being long in a dilapidated state, has recently been thoroughly repaired. This tells us that the 19th Century restoration of All Saints was an early one, and probably explains the patched up feel to the west end - twenty years later, it would probably have been rebuilt. No remains of the fallen tower survive today. A curiosity on the outside south wall of the nave is a cusped tomb recess, said to be variously that of Roger Weyland or Sir John de Crake, founder of the church. In 1855, White found it inside the church, with the mutilated effigy of a man in armour in it, but this has gone today. 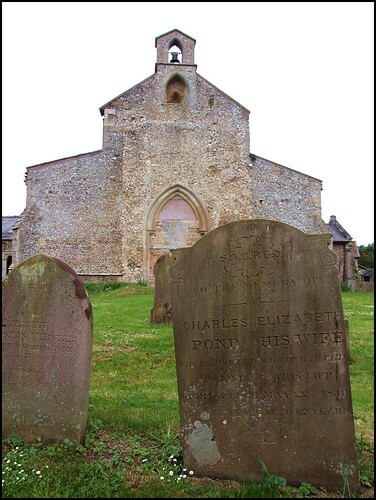 The overwhelming late 13th and early 14th century character of the exterior is reminiscent of neighbouring Gooderstone, and the interior also has a similar feel to that of the church there, although the furnishings here are mostly modern. Anglicans have suffered more than most denominations from falling numbers, and as in several other Norfolk churches the chancel has been screened off by curtains to make a smaller church within a church. These provide a pleasing backdrop to what is an interesting 15th century screen dado, probably by the same artist as that at Gooderstone. Several figures still hide behind the tarrish brown paint applied by the Anglican iconoclasts in the 16th century, a reminder that at one time virtually all screen figures were hidden from sight. Indeed, William Dowsing, the puritan iconoclast of a century later, does not record seeing a single rood screen figure, in the journal he kept of his progress through several hundred churches in Cambridgeshire and Suffolk, even though quite a number of the churches he inspected have rood screen figures today. The most striking figures on the Foulden screen are the four Evangelists on the gates. St Matthew and St Mark on the northern gate have been restored. St John and St Luke on the other have not, but are still discernible. St Matthew looks up in apparent surprise as an angel delivers to him the opening words of his Gospel on a scroll, and St Mark's lion sprawls lazily at the Evangelist's feet. As is common in the iconography of the time, the four are given wings, but they are not angels as has been recorded in some sources. The north side range is completely blank, but the six figures on the south side include St Jerome (his cardinal's hat vivid through the paint) and at least one other is a Bishop, and thus probably one of the other Latin Doctors, perhaps St Augustine. Hauntingly, a crowned Saint peers through the iconoclastic gloom with piercing blue eyes. Spectacular 17th and 18th century monuments, which would overwhelm a smaller church, are left to sulk in silence on the chancel and nave walls. Sam Mortlock thought the 1656 memorial to Robert Longe was pompous, and it is hard to disagree. They seem peculiarly out of sorts with the mystery of the screen, as if symptomatic of the change of emphasis after the Reformation from the authority of the priesthood to the power of the nobility. White's Directory reminds us that this was a particularly charitable parish in years gone by. At the time of the great Enclosure Act, three hundred acres were left open for supplying occupiers of the ancient cottages with pastorage and fuel. Rents derived from land in the parish of Old Buckenham supplied £22 worth of kersey, duffle and flannel for distribution among the poor every fifth year. And every Easter, £18 15s from money left in trust by Elizabeth Longe, wife of the 'pompous' Robert, along with bequests made by Robert Fuller and an unknown donor at Stoke Ferry were distributed among the most industrious parishioners of Foulden, which all three taken together must have provided support for just about all the poorer citizens of Foulden. We set off back towards the Swaffham road, and I thought about how little known this church was - and yet, along with neighbouring Gooderstone, I thought it one of the more interesting churches in this part of Norfolk.